Naiva gripped her spear, leaning on it so she would not collapse from sheer stark terror. The huge dragon filled half the sky, blocking the canyon walls. He floated there effortlessly, his expression amused at her pathetic attempt to look bold. "Little one, you cannot defy me, much less defeat me. But with my help, you can rule this sad little world and make it your own to do with as you wish. Just tell me where Ugin is, and why these hedrons have filled the place he fell." Her throat was so dry the words came out in a croak. "Why do you hate Ugin? He's your twin." The great dragon recoiled, a blast of angry fire roaring over her head. Sparks rained down upon the hedrons that concealed the Spirit Dragon's skeleton, but the flames and glowing ash slid harmlessly off the hard surface. "He's no twin of mine. That's just a story he put about, trying to grab for a share of my glory and my triumph." Naiva cared nothing for Ugin; she'd never met him, and she couldn't imagine any dragon could be a friend to humankind, even if people like her grandmother and Tae Jin's master called him the soul of Tarkir. Yet a seed of strength unfurled in her heart. Somehow, amazingly, this powerful dragon did not know Ugin's body lay concealed beneath the hedrons. That meant he couldn't see Baishya where she lay lost in a helpless trance. The thought of her twin dying filled her heart with such dread that it fueled a recklessly fierce determination. For once, her spear was of no use. She had to find another way. "You are Nicol Bolas," she said, trying to piece together what she'd learned from the stories and memories. He smiled. "Of course I am. Who else could I be?" If he was as the stories claimed, he would be able to get into her mind. Probably he already had. Once he picked through her thoughts, he'd realize Yasova Dragonclaw was right in front of him. Her only hope was to distract him. Hadn't Ugin said not ever to make him angry? If he killed her, then at least she couldn't betray her loved ones. "Yes, I have heard of you. I know all about you. You're a liar when you say you aren't twin to Ugin. You were born together and fell together. Isn't that right?" His roar shook the air. Rocks fell from the canyon wall, rolling and bouncing to crash against the hedron cocoon, but the hedrons held firm because they were stronger than rock. "Of course that's not right! Who told you that?" He loomed closer, his shadow stealing the patch of sun in which she stood. His voice dropped from thunder to a threatening whisper. "Did Ugin tell you that?" She took an involuntary step back toward the hedrons to put distance between herself and his teeth. Wasn't it odd that his first reaction was not to smite her but to quibble defensively? Maybe if she kept him busy she could find a way to get out of this. "If you and Ugin aren't twins, then what are you?" He inhaled with such strength that snow swirled up from where it dusted distant hedrons, spinning around her like a blizzard. His voice boomed over her as he began to talk. This is the truth, not that you can appreciate it, weaned as you obviously have been on lies masquerading as truth. Ugin will have told you we fell together, but that is just his way of muddying the waters, telling half lies that people mistake for truth. I fell out of the wings of the void. Falling was my first sensation: the roar of wind against my scales; a flash of lightning splitting the air; the boom of the progenitor's wing-beats. The thunder of the progenitor's passage woke me from the dream of falling. When I awoke to conscious thought, I knew all at once with full understanding that my destiny is not to fall but to fly. I opened my wings to catch the air. 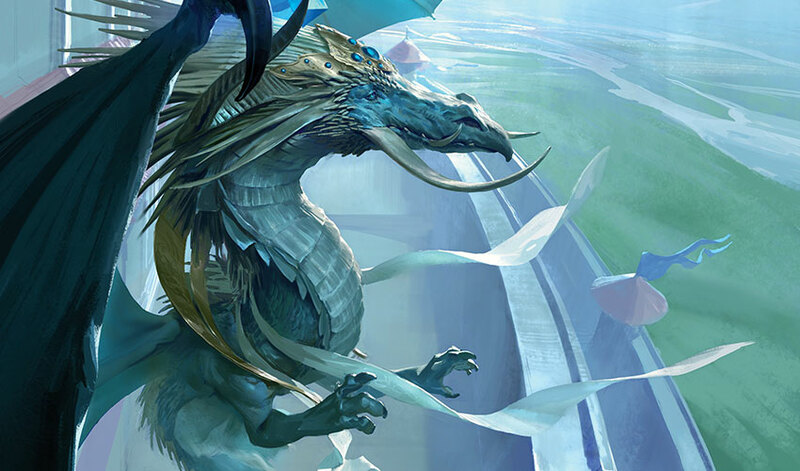 Ugin may tell you that he and I were wrapped together like one creature, born together, falling together, minds waking together in bewilderment and curiosity. He may tell you that as we realized we were beings—minds—consciousnesses—that we unfolded together. Flew together. I beheld the majesty of the sun and the splendor of the heavens and understood the magnificence of my mind in those first instants. Then I recognized the curled-up creature falling helplessly beside me. Of course, my instinct was to help. Using the tip of my wing to swat his flank, I woke him. With my encouragement, he too unfurled his wings. His wings were not so mighty as mine even then, when we were not yet full grown. In this way he discovered flight or, I should say, I taught him that flight is what we dragons are made for. Of course, I immediately noticed we had siblings. The tempest churning within the progenitor's shadowy wings had passed over, leaving us behind in a green and quiet land. We were alone, just the six of us. "Six?" Naiva asked. "Weren't there eight of you? Didn't two fall without waking? Didn't their bodies shatter atop the mountain?" One of his foreclaws swatted down next to her, the impact shaking her off her feet. Her knees hit the ground hard. Pain stabbed tears into her eyes. "Do not interrupt me again!" he thundered. As she braced herself to get back up her face was briefly hidden from his scrutiny, and in this moment of privacy, she allowed herself a tiny smile. How he loved the sound of his own voice! Maybe it would be possible to distract him after all, just as Grandmother all those years ago had chosen to distract Atarka with the promise of food in order to save her people. Falling and flying is how it started. We flew out of joy. We flew on a journey of discovery, eager to learn more about the complicated patterns of landforms and seas. At first, we thought these were living beings like us but soon comprehended this was nothing more than the world's natural order. We flew for what lesser creatures would measure as years. That was our childhood: the heavens, the wind, the sun, and the stars, and the song they made in their glorious existence, a perfect setting for creatures as splendid as we dragons. At last, I alone had the courage, and the hunger, to dare fold my wings and set my claws upon the ground. Of course, that momentous decision presaged all that was and is to come: my wings span the heavens, and my presence, my weight, my size, my claws, all these give me dominion over the earth and all that lives on the earth. So, I named our home Dominaria, because I claimed its song for myself. Naturally, the fractious and unstable humanoids had to be domesticated and made fit to live in peace. My exceptional success at these efforts naturally caused envy among my siblings and cousins, but their resentment and backbiting was easily dealt with by a personage of my talent and wisdom. But all was not triumph in those days. Sadly, Ugin did not prove up to the challenge. In the early years of my struggle, he pledged to stand beside me, but in fact he hadn't the stomach for the work. We had to clear out a nest of particularly foul humanoids who stumbled upon a wounded and already dying dragon and claimed they had killed it. A false sense of victory caused them to swagger about as if they had earned a shower of glory. Of course, they had to be eradicated. But Ugin lost his nerve. He flew out of range of their venom-soaked weapons, watching as I selflessly risked myself to avenge our sister's death. Even he would admit this is true. He made excuses, he quibbled, he whined, he kept trying to talk me out of taking control of a situation that would soon threaten all dragons on Dominaria had it been allowed to spread unchecked. Even when I thoroughly vanquished our foes, he criticized me for my methods, as if I hadn't taken the only path available to end the threat! But I listened patiently to all his wheedling complaints. A few scraps of wisdom percolated up here and there within his words, and I heeded them, too, for I wished for nothing more than to bring a harmonious existence to all sapient creatures on Dominaria. I tried to explain how it would all work out, but he was still frightened. And so, he fled. He vanished, there one moment and then as if with the blink of the eye and a ripple through the air . . . GONE. What a sorrow and a grieving I felt at his disappearance! What a howl of despair I raised! It happened so fast I truly believed it was my fault. I thought I had not properly reckoned with the cunning and hate of the surviving humanoids. I berated myself for overlooking the power of their sorcerers, for it was impossible for me to believe my dear Ugin was a coward. The only explanation that made sense was that a powerful spell had obliterated him right before my astonished eyes. Of course, I rooted out all the humanoid sorcerers in the area. I persuaded them to give up their secrets. Those who refused I killed, while those who cooperated I learned from and then killed later. Since I could no longer trust them. Afterward I wisely created my own academies to train those with magic, so they could serve the greater good under my suzerainty. Naturally my siblings and cousins envied my success. I did not want any conflict with them—"live and let live" is a good phrase, is it not?—but I had no choice if I wanted to protect my people. I could speak at length about the war that the others forced upon me, but that would bore me. Suffice it to say that the wars lasted a long time, many generations as you short-lived humanoids measure time. 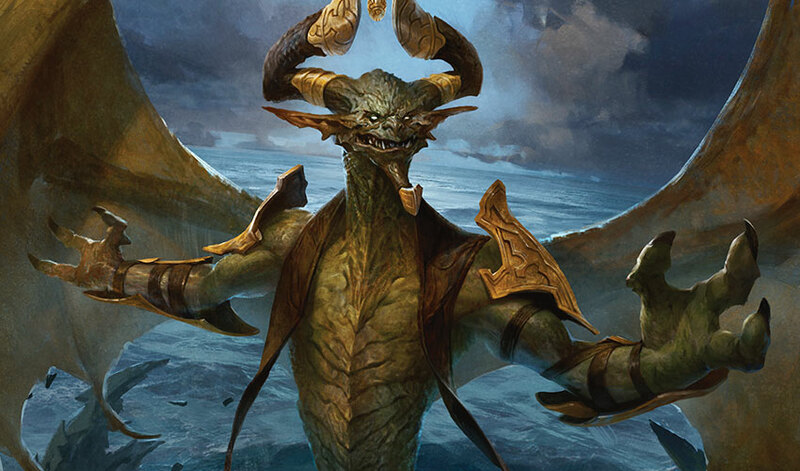 One day, when I had finally driven that stubborn tyrant Arcades into retreat, Ugin returned. He flew right into the middle of our final battle, breaking it off. The shock of his appearance quite undid me. "What sorcery is this?" I roared. "Ugin is dead." "No sorcery. Don't you know me, Nicol?" My hearts swelled with joy, then constricted with fury. "This is some cursed illusion magic wielded by Arcades!" With a blast of fire, I meant to obliterate the mirage. "Nicol! Stop! It's truly me." At the last moment, I turned my ire aside to blow harmlessly away over the land. What if it truly was him? "You're dead. I saw you annihilated by a vile burst of human sorcery. It was their revenge for my victory, destroying what I love most. But I avenged you, and set out to make the world worthy of your vision of peace and harmony." "Is this what you call peace and harmony?" Spoken like Ugin! He was always finding fault with everything I did. But this time I would impress him, and he would admit I was right, that I had surpassed him. "It will be. Come see what I have accomplished. Come, Ugin." 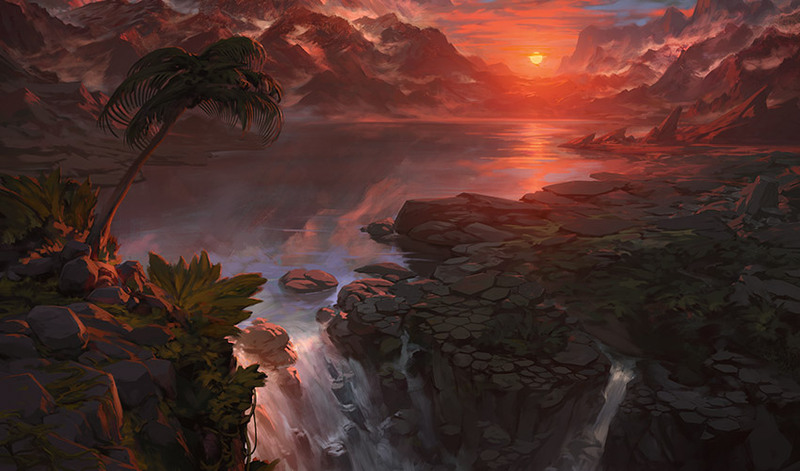 I acted as his guide to Dominaria, showing him all its beauty and splendor, all its power and glory, for he had always stuck close to our birth mountain and feared venturing too far away. When he tired of flying, we returned there and settled upon the birth mountain's peak, now crowned with twin horns in honor of the supremacy of dragon-kind. I surveyed the landscape from our high perch, Ugin silent beside me. I thought he was content, just as I was content to have him back beside me. But in fact, he was seething with envy, as I was soon to discover. "Of course, you never suspected the world to be so vast a place, did you, Ugin? I have traveled everywhere, no place too small or too grand that I have not set claw upon it. No one dares call me "least" now." Ugin laughed. "Do you really believe this petty squabbling means anything in the vast reaches of the universe?" How it pained my hearts to hear this bit of mockery. Of course, I wanted to point out that he'd been hiding all this time in a coward's sanctuary, but I refrained and instead tried to soothe him. "Have you returned only to insult me? I thought we were better friends than that. Now that you are returned, you can share in my triumph, just as we always did before." "I don't want your leavings, Nicol. I have secrets of my own, learned at the feet of a wise woman." "That old human is long vanquished by death and her prattling wisdom nothing more than dust. Her secrets were like bubbles that pop when you touch them: pretty to look at but without substance." "You'll see!" Ugin screamed angrily. He began babbling about planes and walking paths between worlds. "I will find the way, as she promised me long ago, and then you'll be sorry. Then you'll regret thinking you are better than me." The wind rumbled atop the mountain in a howl of storm. Snow fell so thickly that its blizzard obscured him from my vision. In a ripple of warm wind, he was gone. The ugly landscape of his hearts was starkly revealed. Hadn't he abandoned me the first time just when I most needed him? Now he had come back merely to taunt me with the affection I held for him that he clearly did not hold for me. Obviously, he had done it because he was envious of everything I had achieved. My vast intelligence and clever strategies. My mastery of magical skills he wanted for himself and that the old woman had promised him but never delivered. My myriad grateful subjects and the promise of the world I would soon rule as benevolent overlord beloved by all, awe-struck by my majesty and power. How dare he claim to be better than me? How dare he flaunt magic that he refused to share? He was nothing, no one, too weak and cowardly to fight. He was least in standing among us elder-born dragons, not really deserving of even being counted among us. Probably he had hoped to steal my glory and claim it for himself. No wonder he was angry, recognizing he hadn't the gift or strength for what I had so easily managed. And yet sharper than a dragon's tooth, the bite of his insults clawed their way regardless into my hearts. He had abandoned me again. Deliberately. Mockingly. Condescendingly. I, who burned with the bright heat of a thousand suns, felt cold for the first time, cold with the grief of rejection. He had returned with the express purpose of rebuffing my overtures of friendship, of flinging my generosity back in my face. Such a one as he could not feel pleasure in the good fortune of another but only resentment. Such a one as he could gain no satisfaction or delight in the accomplishments and successes of another but only bitterness. Such a one as he could find refuge only in envy. How dare he have what I had not! A white-hot spark kindled deep in my chest with a flash of such sunlit brightness that it blinded me. Impenetrable blackness filled my vision. Tumbling, I fell, totally disoriented, until with a gut-wrenching twist I righted myself. Only to find myself no longer atop the birth mountain but gliding over a boundless stretch of oceanic waters as flat and still as a mirror. I was the only thing in motion, my wings shadowing the sea's surface. There was no sun in this peculiar place, only the water and many craggy islets and a constant shushing whisper of secrets just out of my reach. By a faint humming vibration deep in my bones, I suspected this was not a plane but some manner of artificial construct, built by an unknown agent that had left neither claw nor footprint to mark its authorship. Who, or what, possessed so much power? And why had it been abandoned? With each pop, a sweet vista sprang open before me for a breathtaking moment before it vanished: other lands, other worlds, other planes. With my next breath, I comprehended the whole: I had become a Planeswalker. I had become the very thing Ugin had been ranting about all along, the magic he wanted for himself but could not achieve. After that first unexpected passage, it was easy to keep going, to move in and out through a web of connections linked by a clot of darkness to which everything else adhered. I walked from one world to another to the next and the next. What wonders lay beyond the meager treasures of Dominaria! A hundred worlds I visited, and then a hundred more. Yet in all that time I found no trace of any other creature who could walk between worlds. I was the first among all sapient creatures to discover the possibility of traveling between planes. No wonder eternity and infinity welcomed me, having sojourned alone for so long! I thought of him. I believed we could be friends as we once were at the dawn of days. So I went home. Of course, a great deal of time had passed as you humanoids measure it. The Dominaria I had left was so changed, I barely recognized large swathes of it. The courses of rivers altered; islands sundered; lakes gone dry and seas risen to flood once habitable shores. There I found the wars between the elder dragons over long since. A tenuous peace had taken hold throughout much of the land. Of all the elder dragons and their children, only Chromium Rhuell, Arcades Sabboth, Palladia-Mors, and that vexatious beast Vaevictis Asmadi had survived. Rhuell wandered the land in the guise of a helpful observer, all offering praise for his wisdom and beneficence, yet he was no better than those of our siblings who plundered and ruled, for he poked his snout in wherever he wished, and who among the humanoids could tell him no? Vaevictis still roamed with restless fervor, pillaging and burning as he wished, sometimes teaming up with that ill-tempered creature Palladia-Mors but more often alone. Yet as I searched the wide world over, I found no trace of Ugin. At length, I made my way to Arcades's kingdom, as Ugin and I had once done when we were fledglings. Arcades welcomed me in his most tendentious elder sibling manner, wondering where I had been hiding myself all this time and proudly showing me about the empire he considered meticulously regulated and magnificently vast. But I knew better. "Ugin? I know you and he were particularly close, born as you were. But I haven't seen him since the earliest of days when you two left to root out those dragon killers. You told us he died." "That's not what I said," I corrected him. "He wasn't dead at all. He was just hiding. He returned right at the climax of our last battle." He regarded me with his usual patronizing superiority. "The battle you fled from, abandoning your troops? I gathered them under my wings. They were grateful for my protection, I assure you." "Did you not see him, flying between our armies?" I demanded, utterly astonished by his obliviousness. "You were not yourself that day, Bolas. No doubt you were seeing illusory things. You have always felt shame about Ugin's death, haven't you? Did you blame yourself for not protecting him? Or did you stand aside and allow him to be killed by some venomous sorcery? I've always wondered. I've always suspected you envied him because he was cleverer and wiser than you." I surveyed the graceful architecture and fastidiously ordered streets and districts of the city where he presided from a palace built atop a cliff. And I insinuated a worm of doubt in his haughty mind: Maybe the humanoids who lived here weren't as deserving as he thought them. Maybe they didn't really respect him or follow his laws, but only pretended to. Maybe they were plotting to rise up and overthrow him, for wasn't he nothing more than a tyrant even if he fancied himself a benevolent one? Wasn't that what his subjects whispered, when they were sure he couldn't hear? If he sent out agents into every corner and crevice of the realm, they could report back to him and thus root out instigators. He could offer rewards for people turning in traitors and pay handsomely for people brave and bold enough to turn on their own kinfolk. And if that wasn't enough, then he could burn down suspect districts or even whole cities. Burn them. BURN THEM. With a last smile, I wrapped myself in magic and departed Dominaria. The doubts I had seeded would take root, or they would wither. Either way, Arcades would not trouble me again. He would never walk the planes. He didn't have it in him. Only I did. So, you may imagine my shock and my joy when I walked out of the blind eternities into the place I had come to call my Meditation Realm only to find Ugin there! He was floating atop the waters staring at himself as if he could imagine nothing better than to look at his own reflection. "Ugin! How is it you are here? I am overjoyed to see you, Brother, for I feared I had lost you forever." But he had no words for me. He had only animosity, driven by his anger and envy and resentment and bitterness, by the memory of mocking, condescending laughter. By the fear I would reveal the truth about things he did not want others to know, and that those others would believe me over him. He attacked, viciously and without warning, all raw fury and malignant resentment. I had no choice but to defend myself. First above the wide waters of the Meditation Realm and then on a wild pummeling path through the planes, we struggled for days, years, generations. We battled with claw and tooth and with magic. On and on the struggle raged, for he was unrelenting, rejecting all my attempted overtures for a truce. All he wanted was to kill me for the crime of walking the planes before he did. His hearts were eaten out by jealousy for what I had not shared with him. What could I do? There was no placating him. In the end, by diverse paths, we returned to the Meditation Realm. There, purely in self-defense, I killed him. With a mighty splash, he fell into the still waters. The impact resounded like thunder. Monstrous waves rose from the displacement and swept across the craggy islets, crashing and destroying as they went. The waves ran on and on, washing far beyond the bounds of the Meditation Realm into the web of connection that links the planes themselves and maybe even into the blind eternities whose depths even dragons cannot plumb. The waves spilled out of the Meditation Realm as if Ugin's death had, like a weight dropped upon a ceramic bowl, broken cracks in the vessel itself. The violence of the waves swept me out of the Meditation Realm. 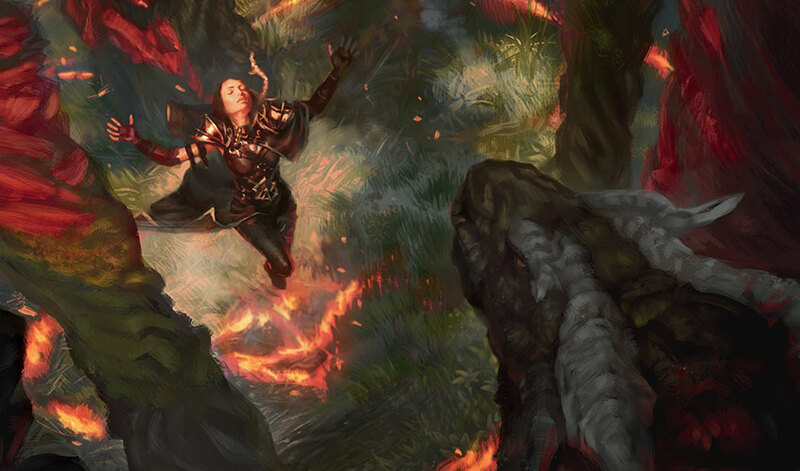 Like a cast spear, I was flung through ten or twenty or a hundred planes before I fell hard back into Dominaria, onto the island chain of Madara at a time when the memory of the Elder Dragon Wars had faded into legend. Bruised and stunned, I struggled to recover my strength, but recover it I did. Many battles lay before me, and I met them with ease. Of course, little Naiva, you must be interested in the long course of my fascinating life, and I would gladly regale you with the whole now that I have set you right about Ugin's false story. But I know you believe you are distracting me from my purpose here. She could no longer see the sky, only his dazzling eyes and the brilliant curve of his horns with the egg-gem spinning mesmerically between the points. His smile showed his teeth. In one gulp, he could eat her. "It always discourages me," he said in a kindly voice, "that people are so quick to think we dragons like the taste of human flesh when in fact it is not to our taste at all." His head dropped lower. She took another step back but could move no farther, trapped against the hedrons. "What you don't understand is that I have all the time in the worlds, while your time is running out fast. Now. Where is Ugin?" "So I believed when I killed him in the Meditation Realm. I departed, believing him dead. That was my mistake. Because somehow, he wasn't dead. He has plagued me ever since, most recently with a misbegotten plan to trap me on Ixalan by means of a magical artifact." "Ixalan?" She croaked out the word, anything to keep him talking. "The name means nothing to you. It's another plane. One you will never see in your entire short, brutish, nasty life." Her limbs were cold and her heart was sluggish, as if her body had decided it was better to collapse into insensibility than face the shattering power of Nicol Bolas, Ugin's greatest enemy. But she would not cringe. "Ugin is dead." She forced out the words in a harsh whisper. "His bones lie right here. Beneath the hedrons." "Ah. Hmm." His rumble unnerved her as his gaze scanned the formation winding out of sight beyond the curve of the canyon. "His falling body cleaved this canyon. I suppose it's possible his bones really do lie here." "Can't you see the bones?" He slapped a foreclaw on the ground, the sound echoing off the canyon walls. "Do not question me. It's a shame the others consider you expendable, isn't it?" "Expendable? They rely on me!" "You cannot be so naive, little one. Your grandmother tolerates you only because she finds you useful in protecting the grandchild she clearly cares about, the one who inherited the shamanic gifts. You have no magic, do you?" "Yes, yes, you're a hunter. Everyone is a hunter. But your sister is a shaman. There's nothing worse than discovering someone you love holds tightly to a gift they've denied you. That they refuse to share with you. That you're expected to pander to and flatter them, admire them, when really, you're the valuable one. You're the one who will feed the tribe in the years to come. You're the one who will lead the people into the high mountains in the summer and to the lowlands during the winter. You're the leader, burdened by this sister you never asked for and didn't really want. They keep holding you back because of her, making you watch over her, wait for her, not giving you the scouting and hunting responsibilities you've earned with your skill. It's just not fair. If you were free of her, then you could finally come into your own, couldn't you? You could finally become the great hunter and leader you deserve to be. And I can help you with that, Naiva." His words, uttered in such a soft, persuasive tone, insinuated themselves into her heart. The old resentment sparked. All the annoyances of years past clawed their way back into the forefront of her mind, throbbing like a headache only he could soothe. But she couldn't trust him. She clung to that fading thought. "How can you help me? Why would you help me?" 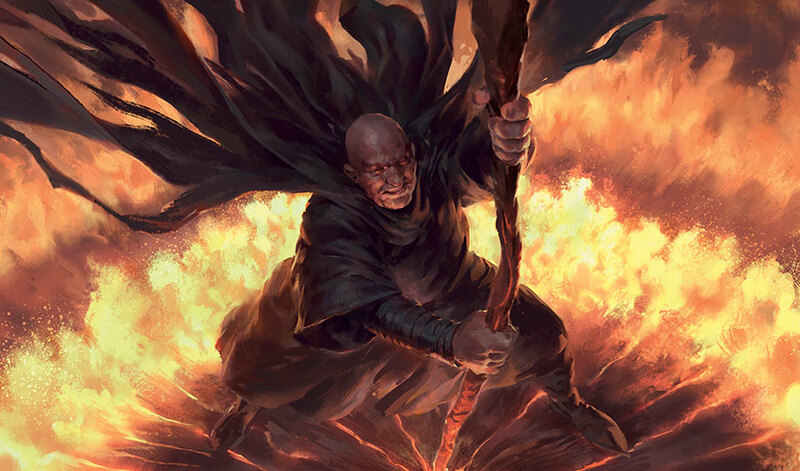 "Because if I don't help you, then I will be forced to destroy Tarkir. Wouldn't that be a shame? Especially since you are the only one who can prevent its destruction." "Why would you destroy Tarkir?" she whispered hoarsely, horrified and shaking. "Because he loves Tarkir. But mostly so there can be no chance of him being reborn here." He paused, then huffed a soft warm breeze, like magic, over her trembling body. "Do not fret, Naiva. I don't want to annihilate this plane because I'd rather help you. 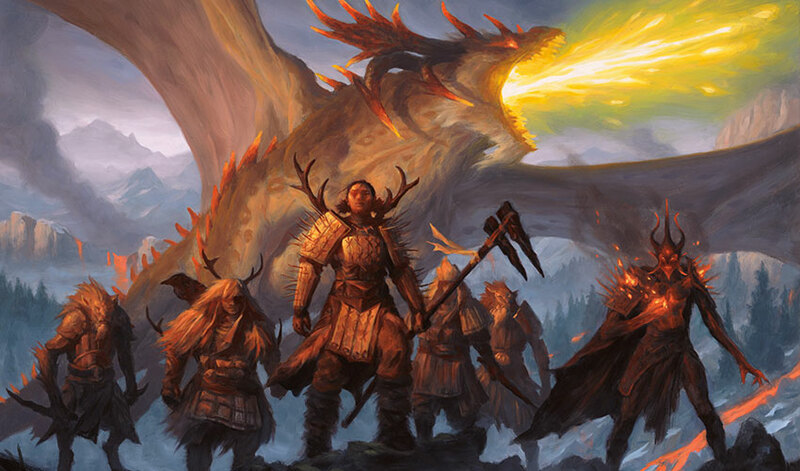 Together, we will clear Tarkir of all your enemies, all the dragons and all the other tribes. You can hunt the wide world over with no one to stand in your way. I will bring about everything you have ever dreamed of because I have that power, and I will use it on your behalf. All you need do is bring me Yasova. Now." Now. The word reverberated in her head. It was true, after all. Baishya had always been a burden heavier than a net of dead goblins. When Grandmother died, no family group would risk taking in a young, inexperienced whisperer whose presence could get them all killed. Why should she be asked to give up everything she wanted just to protect her sister? The old ways had never belonged to Naiva. They were just obstacles in her path forward. "She's here. Right here. Hiding." His smile lit the entire world. "Fetch her for me. Then you will receive your reward." There was no future for her in clinging to the past. She'd been right when she'd told Tae Jin that the old ways were a corpse better consumed by vultures. Yet when she thought of the young ghostfire warrior, of his courage and sacrifice, a shudder passed through her frame and ripped a gash in her certainty. What would Tae Jin say when he learned she had handed over the great Yasova Dragonclaw to Nicol Bolas? "Little Naiva, you mustn't believe I want to hurt Yasova. I want to help. That's all. Now go." His voice hardened. A pressure built in her head until she thought her skull would burst. "Now." Kneeling, she pulled aside the fragment of broken hedron and crawled in. There, in the dim, stuffy confines of the space, Baishya lay as if asleep, breathing evenly. Grandmother sat cross-legged in mediation, eyes closed, left hand resting open on a thigh while her right hand grasped Baishya's bare fingers with an affectionate clasp. The gesture ate a hole of envy right through Naiva's heart. Grandmother had always preferred Baishya. She loved her more than she loved Naiva. She would have to bodily haul Grandmother outside. But that could wait. Pulling her knife from its sheath, she pressed the blade against Baishya's vulnerable throat.